Healthy people engage in dialogue where they discuss, negotiate, compromise as well as respect one another’s differences, feelings and desires. A manipulator pushes and pressures to get his/her own way by ignoring stated or implied boundaries, trying to get you to back down, make you feel guilty or afraid so that you will give in and give them what they want. “You said you would sign for the loan.” (When you only said maybe you’d sign for the loan). These forms of manipulation are often more non-verbal: the silent treatment, bad moods, nasty eye contact, uncontrollable sobbing, banging things, slamming doors, etc., until you give in and do what he/she wants. 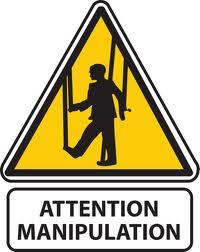 Watch for our next newsletter, when I'll talk about countering the manipulator's tactics. Question: I’ve read you book and blogs and I’m ready to say some hard words to my husband and implement tough consequences for his abuse and controlling behaviors if he won’t change. But I’m wrestling with feelings of guilt. For so many years I’ve endured his abuse and mistreatment; why am I wrestling with feelings of guilt? After all this time and all the destructive behavior, why do I feel bad about telling him the truth and finally setting boundaries? What is wrong with me? I feel like a bad wife and Christian. Can you help me gain some clarity? Answer: Your question blends beautifully with this month’s newsletter, Nine Tactics of Manipulators. One of those tactics is guilt trips, and those of us who have been captured by the fear of man worry what other people think of us. We often feel guilty when we do something we know they won’t like or if they express anger, disapproval or disappointment for the thoughts we have, the desires we express or the stand we’ve taken. Obviously your husband is not going to like that you are going to be setting some boundaries or saying “no more” to some of his controlling and abusive behaviors. Sign up to receive Leslie's Blog via eMail! Free Webinar on Emotionally Destructive Marriages! 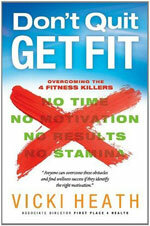 Don't Quit Get Fit Book by Vicky Heath. Plus see the winner of the previous give away! Don't miss a single blog post! Sign up today to receive Leslie's blog posts right in your email INBOX. Use the link below to sign-up by filling in the opt-in box in the top of the left hand sidebar found on the webpage. Sign-Up to receive Leslie's blog via e-mail! On May 15th at 8:00 PM (ET) I will be offering a free webinar on The Emotionally Destructive Marriage. Watch future newsletters for details on how you can be a part of that webinar and invite interested friends. Every day, people give up trying to get in shape because they buy into the lie that being healthy is as simple as eating less and exercising more. But living healthy for a lifetime begins with a change of mind, not just a change in what we do. In Don’t Quit, Get Fit, fitness instructor and life coach Vicki Heath helps readers understand why they have failed in the past and shows them step-by-step how to develop lasting motivation for a lifetime of fitness. Readers will learn how to develop a healthy relationship with food and with their body, and will define their wellness goals using the one-of-a-kind Don’t Quit, Get Fit evaluation tool. Just email your name to assistant@leslievernick.com by midnight Friday, April 19th for a chance to win one of two copies! Congratulations to Cheryl N. of Palo Cedro, CA and Marie H. of Fredericton, Canada winners of the THE INVISIBLE BOND Book by Barbara Wilson. "We were blessed by the truths that she presented so clearly. Throughout the weekend and since that time, our staff has received numerous comments on how helpful, practical, powerful, and timely Leslie's messages were to them. Leslie was able to share deep truths of God's Word regarding how to live a life that pleases God in the midst of difficult circumstances and relationships in a way that people could understand and relate to."